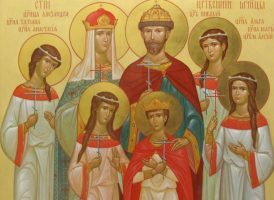 Tsar Nicholas II and his family, whose memory we celebrate today, are now venerated as saints throughout the Orthodox world. This, however, has not always been the case: for many years they were vilified both in Russia and in parts of the Russian émigré community (as they continue to be by some contemporary historians). 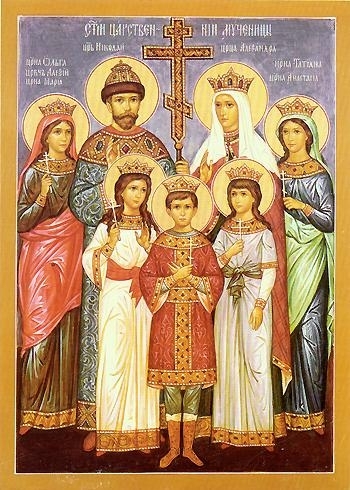 This should be borne in mind when reading the following sermon, given by St. John (Maximovitch), then Bishop of Shanghai, on the anniversary of the martyrdom of the Royal Family in 1934, nearly half a century before the Royal Family was glorified by the Church Abroad and close to three-quarters of a century before their glorification by the Church in Russia. St. John’s words would have sounded anything but commonplace at the time he delivered them. Tomorrow the Holy Church celebrates the memory of the Holy Hierarch Andrew, Bishop of Crete, author of the Great Penitential Canon, while we have gathered to pray for the repose of the souls of the Tsar-Martyr and those killed with him. In Russia, people likewise gathered in churches annually on the day of St. Andrew of Crete– not, however, on the day of him whose memory is celebrated tomorrow, but rather of the Venerable Martyr Andrew, who was martyred for his confession of Christ and Christ’s truth. On the day of the Venerable Martyr Andrew, people in Russia joyfully gathered to give thanks to the Lord for the miraculous deliverance of Emperor Alexander III in Borki on October 17, 1888. A terrible train wreck took place during his journey that destroyed all the cars except the one carrying the Tsar and his family. Thus, on the day of the Venerable Martyr Andrew of Crete, who was martyred by the enemies of Christ and His Church, the heir and future Sovereign, Nicholas Alexandrovich, was saved; likewise, on the day of the Holy Hierarch Andrew of Crete, who peacefully completed his days on earth, the Sovereign was killed by the godless and traitors. On the same day that the Venerable Martyr Andrew was honored, Russia also celebrated the memory of the Prophet Hosea, who foretold the Resurrection of Christ. Churches were built in their honor, in which the Russian people gave thanks to God for the deliverance of the Sovereign. Thirty years later, on the day of the Holy Hierarch Andrew, the teacher of repentance, the Sovereign was killed before the eyes of the entire nation, which did not even attempt to save him. This is all the more frightful and inconceivable given that the Sovereign, Nicholas Alexandrovich, embodied the best traits of the Tsars whom the Russian people knew, loved, and honored. The Tsar-Martyr most of all resembled Tsar Alexei Mikhailovich, the Gentlest, yet he surpassed him in his unwavering meekness. 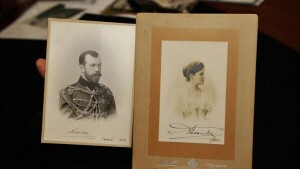 Russia knew Alexander II, the Liberator, yet Tsar Nicholas II freed even more peoples from among our brother Slavs. Russia knew Alexander III, the Peacemaker, yet the Sovereign, Nicholas II, did not limit himself to caring for peace in his own time, but took a major step towards ensuring that all the peoples of Europe, and of the entire world, would live peaceably and resolve their misunderstandings in a peaceful manner. To this end, by his selfless and noble personal initiative, the Hague Conference was convened. Russia was delighted by Alexander I, calling him the Blessed for freeing Europe from the alien power of one man. The Sovereign, Nicholas II, in conditions far more difficult, rose up against the very same attempt by another man to extend his power over the Slavic people, alien in blood and faith to him. He displayed a steadfastness in their defense that knew no compromise. Russia knew the great reformer Peter I, yet if we call to mind all the reforms of Nicholas II, we do not know to whom to give preference, given that the latter’s reforms were carried out more carefully and thoughtfully, and without harshness. 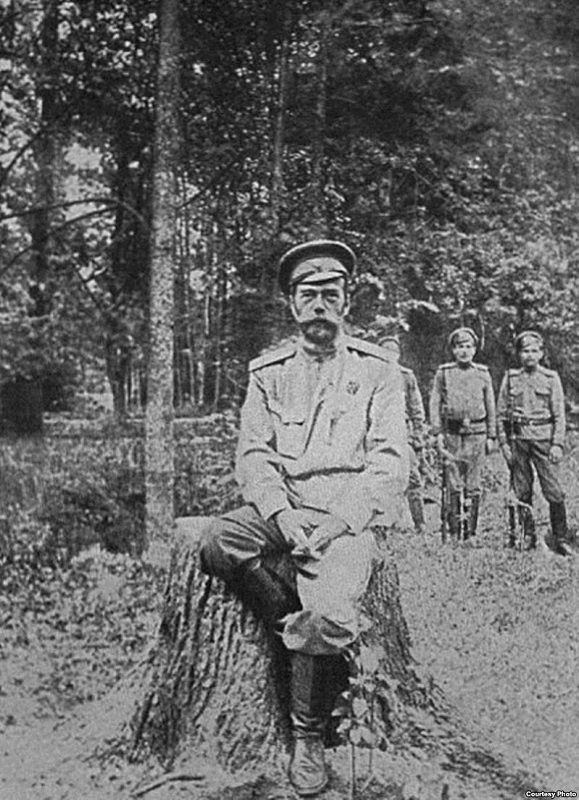 Russia knew Ivan Kalita and Ivan III as the gatherers of Russia, yet the Sovereign, Nicholas II, completed their work in 1915 when he returned to Russia all her sons, albeit for a short time. The Sovereign of All-Russia: he was the first and only Tsar of All-the-Russians. His inner, spiritual, and moral countenance was so glorious that even the Bolsheviks, wanting to discredit him, could accuse him of one thing only: godliness. It is known for certain that he always began and ended his day with prayer. On great church feasts he always received Communion, sometimes mixing with the faithful who were approaching the Great Mystery, as he did at the uncovering of St. Seraphim’s relics. He was an example of chasteness and the head of an exemplary Orthodox family, bringing up his children in readiness to serve the Russian people and carefully preparing them for the toil and labor to come. He was deeply attentive to the needs of his subjects, wanting to understand clearly and intimately their labor and service. All are familiar with the case of how he walked alone for several versts in full soldier’s gear in order better to understand the conditions of military service. He then walked alone, thereby clearly refuting those slanderers who say that he feared for his life. If Peter I could said: “As for Peter, be it known that his life is not dear, so long as Russia lives on,” then one might say that the Sovereign, Nicholas Alexandrovich, fulfilled these words more truly. They say that he was too trusting. But the great Father of the Church, St. Gregory the Great, said that the purer the heart, the more trusting it is. But with what did Russia reward her pure-hearted Sovereign, who loved her more than his own life? The Leader of Rus’ was killed below the vault of the Yekaterinburg cellar, deprived of the royal crown by human insidiousness, but not deprived of his sacred anointing by God’s justice. Every regicide in the history of Russia was committed by some clique, not by the people. When Paul I was killed, the people did not know about it; and having found out, they brought their sympathy and prayers to his grave for many years. The murder of Alexander II brought about a storm of indignation in Russia, which improved the moral condition of the people, as became evident during the reign of Alexander III. 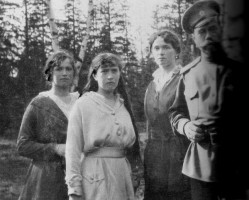 The people remained innocent of the Tsar-Liberator’s blood. But here the entire people is guilty of the spilled blood of their Tsar. Some did the killing; others approved of the killing, thereby committing no less of a sin; still others did nothing to prevent it. All are guilty and truly we must say: His blood be on us, and on our children. Betrayal, treason, the violation of the oath of fidelity to Tsar Mikhail Feodorovich and his heirs; passivity, cold-heartedness, and insensitivity – from these the Russian people wove the wreath with which they crowned their Tsar. Today is a day of sorrow and repentance. Why, we ask, did the Lord deliver the Tsar on the day of Andrew the Martyr, but did not deliver him on the day of the other Andrew, the teacher of repentance? It is with profound sadness that we reply: Yes, the Lord could have saved him this time as well, but the Russian people were not worthy of this. The Sovereign has now received the crown of martyrdom, but this neither justifies us, nor does it lessen our guilt – just as Judas, Pilate, Caiaphas, and those who demanded Christ’s death of Pilate were not justified by the Resurrection of Christ, but even more severely indicted. It is a great sin to raise one’s hand against God’s Anointed. When news of Saul’s murder was brought to King David, he ordered the messenger to be killed, even though he had not taken part in the murder, but only rushed to bring the news, thereby implicating himself in the King’s murder. The very least involvement in such sin does not remain unavenged. In sorrow we say: His blood be on us, and on our children. But let us remember that this crime of the entire people was committed on the day of the Holy Hierarch Andrew of Crete, who calls us to profound repentance. Let us remember that there is no sin that cannot be washed away by repentance. But our repentance must be complete, without any self-justification, without reservation, condemning ourselves and the entire evil deed from its very beginning. After the deliverance of the Royal Family in Borki, an icon was found depicting the saints whose names the members of the Royal Family bore. Perhaps the time will come when not only their patron saints, but the Royal Martyrs themselves, will be depicted on icons, in memory of the event we have recalled here. But for now we will pray for the repose of their souls, asking of the Lord profound tears of repentance and forgiveness for ourselves and the entire Russian people.